Much of my inspiration comes from the world of nature…but with a subtle twist of the surreal! I love to look at objects up close and imagine that I am small and crawling around inside. Many of my pieces come from these fanciful journeys. I am surprised by the variety of sources for my ideas. There are times when a poem will inspire a work; other times the inspirations comes from the spoken word of another, sometimes from a memory, or from a dream. I have awakened in the middle of the night and sketched out an idea. Every piece tells a story of where I am – or was during that period. I feel a need to give life to the images that arise from my explorations and adventures, for example, while snowshoeing high in the Rockies I plopped down on my back in the snow to rest. 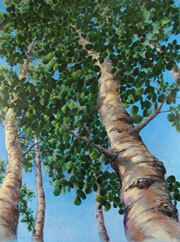 I was directly between two glorious aspen trees reaching up to and intensely blue sky. My Seasons series was born on that day. Often when I am hiking in the mountains my attention is caught by the twisted roots of a tree or by a hole where a squirrel might live. I peer into the trunk of a hollow tree and think it looks like a wonderful place to live. I find myself looking into something small or way down a path, imagining where it might lead and wanting to explore. I want to travel there and feel something good is at the other end. I have been inspired by the fanciful and religious writings of C.S. Lewis, the way his worlds and magical places lead to lessons about God and living life to its best. Thus, many of my images are designed to encourage one to travel toward the Truth and Light, whether it be in an imaginary, wonderful land inside a tree or flower, down a path in the woods, or into a land full of stairways and doors. When I am painting, I am traveling to these places as well as yearning to be closer to God. Someday I hope to see a place, which my painted ideas only slightly mirror. That land would be saturated with perfect love and infused with light coming through colored glass and down beckoning stairways. I like to give credit to the artists who have influenced me: Edward Hopper, Georgia O’Keefe, Jamie Wyeth and Louise Nevelson. They have all inspired me with their techniques and by the journeys I have traveled through their works.